I got curious about political correctness with some friends over dinner, we did some quick reading about why it was labeled as such and did some reading and kinda blew my mind a bit. 1) The term was used very rarely - by communists a bit to talk about what was good for the party, then by liberals actually warning each other not to be too orthodox. was never a big thing. we were not providing pamphlets telling people to use "african american" instead of "black". 2) It was picked up by the media to sell newspapers with stories about this huge "controversy" - liberals wanting people to be politically correct on college campuses. 3) Conservative authors blew it up as a cautionary tale and lead to its first widespread use. They wrote whole books about it, gave interviews, provided the stories, acted like the left was coming at America with pitchforks and torches over political correctness, when in reality it was something we'd barely mentioned. In other words, it was pure backlash. Not a real backlash against something - it was never a big part of discussion on the left. And now where are we? I was telling a friend that the term is just so hard to debate. You tell a guy "hey, don't be a jerk?" and he responds with "oh you want me to be POLITICALLY CORRECT huh?" and you know that nobody likes the term "politically correct" - it means you can't be funny, honest, normal, rational. But how do you backlash against a backlash? So yeah - it's so easy to say "oh please let's not go overboard with the politically correct speech here!" or "hey I might not be politically correct but I'm funny right!" But when we do that we're giving into the botched-up version of the story that politically correctness was something people really cared about at one time - it wasn't. It's a lot like feminism in that the wrong side has shaped people's perceptions and taken over the story, when I hear people say "Well I'm all for women's rights but I'm not gonna burn my bras okay, settle down feminists!" when we looked into it and found that bra burning was never actually a thing. We need to tell the honest version of the story here. When someone wants to use an offensive term, and justifies it by saying they're fighting the good fight against political correctness, don't give them that. Political correctness was an accusation thrown with no evidence to support it. It's really a conservative idea - not a liberal one. I never asked anyone to be politically correct. I asked them to stop being assholes. Yeah, it's a straw man. It's like when someone makes a joke that offends or makes light of another person's real pain and then when that person objects - "Hey, you know I was raped/have a disability/have a person of color in my family" - the jokester says, "Oh, don't be so sensitive," e.g.., it's your problem for having a thin skin and I resent having to think of other people who don't have my white/ableist/male privilege. once you hide behind this cover, there is nothing more to debate and conversation ends. Because yeah, how do you debate that!? The best way to change people's ideas is to get them to critically examine those ideas themselves. Ask what does speaking in a 'politically correct' way entail? And what effect does it have on the person being addressed or talked about? Check out http://youarenotsosmart.com/2011/06/10/the-backfire-effect/ and http://www.nytimes.com/2012/10/21/opinion/sunday/why-partisans-cant-explain-their-views.html?_r=0 and https://www.brainpickings.org/2015/05/20/blaise-pascal-pensees-persuasion/?utm_content=buffer495cd&utm_medium=social&utm_source=twitter.com&utm_campaign=buffer to see the articles that informed my above statement. 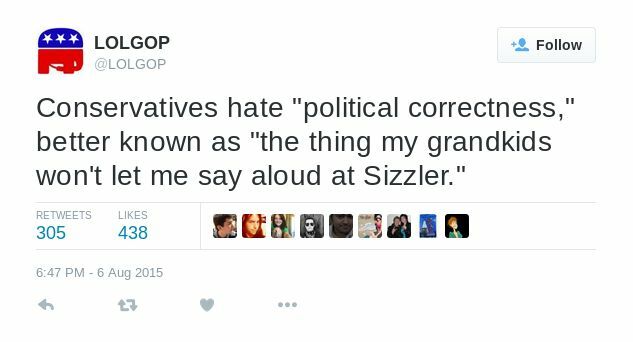 Next time someone tries to shut down a conversation by mentioning 'political correctness' I intend to ask them what they mean by that. I find 'political correctness' and the backlash against it to be similar to the term 'social justice warrior'. When people say 'I hate being politically correct' what I usually hear is 'I don't care if I hurt other people with my words and have no interest in learning about or empathizing with things that do not already fit my viewpoint.' (note that it is the OBJECTION to being PC that makes me think this, not simply not being PC). Sort of how I have never understood the insult in being labeled someone who is a warrior for social justice. I mean, what a badass term to be given derisively, right? The conservatives in this country are very good at creating a backlash against strawmen, and they've gotten it down to an art since the rise of Fox News. I feel like half their politics these days are based on outrage at things that don't actually exist (or are barely notworthy statistically speaking). Voter fraud, welfare recipients on drug, unemployment fraud... as another commenter says, the freaking "War" on Christmas. We're writing policy based on fiction these days. It's scary. And dang it I can't find it, but I recently read another rant where someone did not understand why social justice warrior is an insult. Even if that is true, but one cannot deny that liberals made this term part of their agenda and from America this virus spread all over the world, so that everyone who defines himself as that and has seen a campus from the inside finds policing what other people think and say as an unseparable task from what he engages for when he makes the step to activism. And that constantly keeps harming and damaging leftism in all its kinds and colors. I'm not denying that a liberal used the term, what I'm debating here is the campaign. I haven't heard anyone with personal first hand experience where they got in trouble in college and were told to be "politically correct" - the fear was drummed up against something that didn't really happen. These days the greatest battlefield for this is just the internet and where else activism keeps hanging around. "Oh, you said this? You gotta say you take distance from that if you want to keep your reputation!" "Oh, he said this? I don't wanna have anything to do with him anymore! ...ist!" In the universities people of interest complain about such courses like "gender studies" being almost solely in the hand of women - and what they tell and write is just radical feminism which spits nothing more than hate against men and scientific lack of objectivity. At least that's the few bits I get to acquire (and that's already enough for me to get sick). It's a spectacularly effective tactic for shutting down any discussion of a topic by tying it to a poisoned term. I'm hoping that socialism manages to escape this, at least in the mainstream press, through Bernie Sanders' efforts. I always think "'political correctness'? you mean, 'being polite'?" Too bad facts have a liberal bias.